And because the metric call ?. Well I’ll try to do a simile explaining another “possible way” to travel faster than “c” (speed of light). There is another theoretical method to travel at higher speeds than the relativistic (that light, which noses) which is known Einstein Rosen Bridge “pulled” into the fray over 1940. 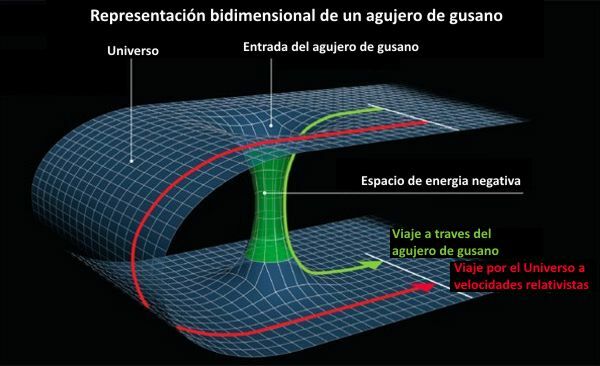 The street people known as as the “wormhole” and if it is something very simple. In principle it is imperative to know the topology of our universe (something that I said we really do not know unless this curved by general relativity and in specific areas since it is generally flatter than a sheet on a table). It is assumed that the topology is curved over long distances, then if the topology of two very distant points, the curve could be very close. That is, the similar is put is a folded sheet. On sheet two points can be on either side of the paper, but as the topology of the universe is curved, if we bend the paper can place a dot above the other. If we could leave our topology and open a hole in it we could move from one to another crossing point less space than “throw straight on the road”. As an example we can assume the same on Earth, because to get two points can only walk on the surface, but this is not the smallest of the distances as it is an arc what are traveling (a geodesic, for friends) which is greater than the straight line joining the two points. With Einstein Rosen Bridge same thing happens, we play with the metric of the universe (and therefore with its topology) to move between two points. And what is the problem not to use them ?. Well, first is that they have never seen, then everything is theory. Second, not know (as I repeated) the exact topology of our universe (a toroid? A Mobius strip? A sphere? A potato?) And third (and more serious) is that if wormholes exist, and quantum physics, is a union between two branes d (a geometric union of several ropes, either at one point, a plane or an n-dimensional as a summary space) can join the d branes wrong (we go one different from the original one) and strength that create (or energy) unless you’re looking for and end up not in the physical place we want but “something” whose properties are not known, ie, the typical example it gets is “a different time” (but I wish it was this most troubling). Anyway, as you can see, the two ways that I have mentioned are more dependent on the topology of other things because it is the base that are plausible or not. Remember that these “talks” are very light since, so I’ve been told this weekend, those who base their knowledge of the world have no idea math or see an equation (and less understanding), give them to review Lorentz transformations, differential geometry or the mere sight of a differential equation (not separable), makes them head hurt them. “Physical Hammer” called. For that reason, I relax many terms and try to display that it obviates is absolutely necessary to know the talk and try, I hope that, if interested, are made to learn and study (unhurried, as it is a process of years) the basis to understand and see the beauty of all these things.